Nine German and American civilian employees were honored for 10, 15, 20, 25, 30, 35 and 45 years of service to the U.S. Army in a ceremony here Aug. 29. 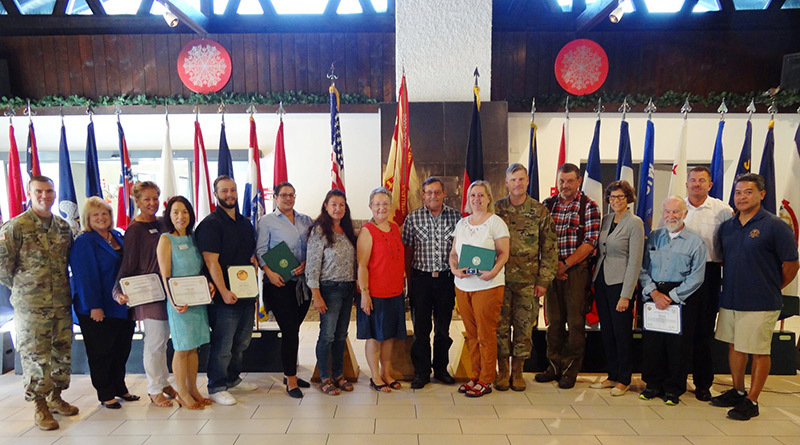 GARMISCH, Germany — Fifteen German and American civilian employees were honored for 10, 15, 20, 25, 30, 35 and 45 years of service to the U.S. Army in a ceremony here Aug. 29. In total, the honored employees — coupled with those not present at the ceremony — have racked up 325 years of service. In addition to the length of service awards, Varney presented certificates of appreciation to Preston Lee for his support to the chaplain, and to Andrea Griesser for her support to motorcycle safety day. The Garmisch mayor Dr. Sigrid Meierhofer was also in attendance to honor the employees’ dedicated service. To view photos of individual awardees, visit our Garmisch Length of Service Award Ceremony photo album at https://flic.kr/s/aHsm24S287.